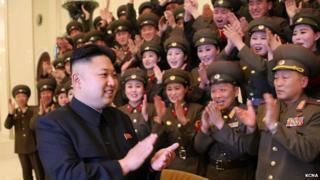 "Our leader's haircut is very particular, if you will," one source tells Radio Free Asia. "It doesn't always go with everyone since everyone has different face and head shapes." Meanwhile, a North Korean now living in China says the look is actually unpopular at home because people think it resembles Chinese smugglers. "Until the mid-2000s, we called it the 'Chinese smuggler haircut'," the Korea Times reports. It seems that haircuts have been state-approved in North Korea for some time - until now people were reportedly only allowed to choose from 18 styles for women and 10 for men. Earlier, North Korea's state TV launched a campaign against long hair, called "Let us trim our hair in accordance with the Socialist lifestyle". However, there are conflicting reports over the haircut mandate, with the NK News website reporting that recent visitors to Pyongyang did not notice a change in hair styles. Late leader Kim Jong-il, who ruled North Korea for 17 years, sported a bouffant hairstyle, reportedly in order to look taller. UPDATE: An earlier version of this story said, according to reports, the haircut guideline applied to men rather than university students.